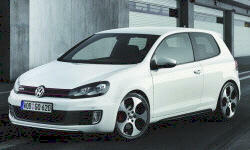 Volkswagen Golf / Rabbit / GTI Tires Pros and Cons | Page 1 of 1 | Why Not This Car? Stock Dunlops (A/S) are noisy and not especially grippy. Golf TDI comes with low rolling resistance all-season tires. They are OK around corners, but not very good when braking, especially on wet roads. I wish I had insisted on performance tires (or winter snow tires) rather than "no-season" tires that I got.